On Taxis and Rainbow Tables: Lessons for researchers and governments from NYC’s improperly anonymized taxi logs. 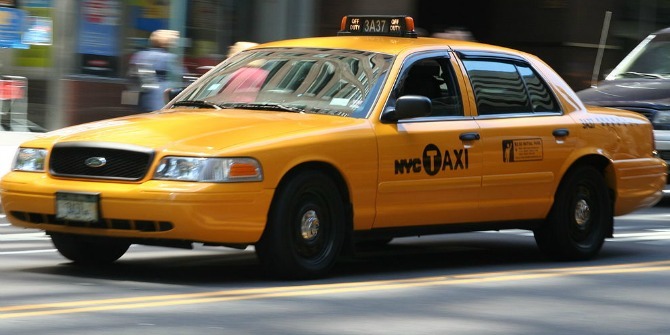 When New York City’s Taxi and Limousine Commission made publicly available 20GB worth of trip and fare logs, many welcomed the vast trove of open data. Unfortunately, prior to being widely shared, the personally identifiable information had not been anonymized properly. Vijay Pandurangan describes the structure of the data, what went wrong with its release, how easy it is to de-anonymize certain data, and the lessons researchers and agencies should learn from this. Recently, thanks to a Freedom of Information request, Chris Whong received and made public a complete dump of historical trip and fare logs from NYC taxis. It’s pretty incredible: there are over 20GB of uncompressed data comprising more than 173 million individual trips. Each trip record includes the pickup and dropoff location and time, anonymized hack licence number and medallion number (i.e. the taxi’s unique id number – 3A37 on taxi roof sign and license plate below), and other metadata. These data are a veritable trove for people who love cities, transit, and data visualization. But there’s a big problem: the personally identifiable information (the driver’s licence number and taxi number) hasn’t been anonymized properly — what’s worse, it’s trivial to undo, and with other publicly available data, one can even figure out which person drove each trip. In the rest of this post, I’ll describe the structure of the data, what the person/people who released the data did wrong, how easy it is to deanonymize, and the lessons other agencies should learn from this. It’s pretty obvious what format most of the fields are in (lon/lat, timestamp) but the first two columns demonstrate that the government folks clearly intended to anonymize the medallion and licence numbers. It’s obvious that the alphanumeric codes are not purely random, the same taxi and same driver always has the same code throughout the data. This isn’t necessarily a problem — in fact, preserving this property is often of critical importance when anonymizing data. Imagine a search engine engineer who wants to analyse user behaviour in aggregate: it’s important that the same user has the same code throughout the set of logs that are being analysed, so that you can see what a user does over time. It’s obviously also critical that it’s not possible to go backwards from the code to the user’s name. Someone on Reddit pointed out that one specific driver seemed to be doing an incredible amount of business. When faced with anomalous data like that, it’s good practice to weed out data error before jumping to conclusions about cheating taxi drivers. Also, I couldn’t shake the feeling that there was something about that encoded id number: “CFCD208495D565EF66E7DFF9F98764DA.” After a little bit of poking around, I realised that that code is actually the MD5 hash of the character ‘0’. This proved my suspicion that this was actually a data collection error, but also made me immediately realise that the entire anonymization process was flawed and could easily be reversed. A cryptographically secure hashing function, like MD5 is a one-way function: it always turns the same input to the same output, but given the output, it’s pretty hard to figure out what the input was as long as you don’t know anything about what the input might look like. This is mostly what you’d like out of an anonymization function. The problem, however, is that in this case we know a lot about what the inputs look like. It took a while longer to de-anonymize the entire dataset, but thanks to Yelp’s MRJob, I ran a map-reduce over about 10 computers on EMR and had it done within an hour. There’s a ton of resources on NYC Taxi and Limousine commission, including a mapping from licence number to driver name, and a way to look up owners of medallions. I haven’t linked them here but it’s easy to find using a quick Google search. Security researchers have been warning for a while that simply using hash functions is an ineffective way to anonymize data. In this case, it’s substantially worse because of the structured format of the input data. This anonymization is so poor that anyone could, with less then 2 hours work, figure which driver drove every single trip in this entire dataset. It would be even be easy to calculate drivers’ gross income, or infer where they live. The cat is already out of the bag in this case, but hopefully in the future, agencies will think carefully about the method they use to anonymize data before releasing it to the public. This piece originally appeared on Vijay Pandurangan’s personal blog and can be found here. Vijay Pandurangan is the founder and CEO of Mitro(www.mitro.co). He previously worked at Google, where he built infrastructure, ads, and mobile software. Follow him on twitter: www.twitter.com/vijayp Web: www.vijayp.ca.